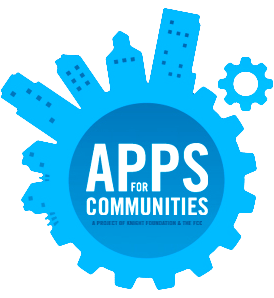 A prize for the app that can be replicated and used across the most local communities. A prize for the app that best impacts people with limited digital proficiency. App that best impacts people with limited English literacy. Making local public information more personalized, usable, and actionable for all Americans. Can a mobile app improve the quality of life for a farmer in America's heartland? Can a web app help school children in Detroit, MI? The Knight Foundation and the FCC challenge you to develop a software application (app) that delivers personalized, actionable information to people that are least likely to be online. Using hyper-local government and other public data you should develop an app that enables Americans to benefit from broadband communications -- regardless of geography, race, economic status, disability, residence on Tribal land, or degree of digital or English literacy -- by providing easy access to relevant content. create better links between Americans and services provided by local, state, Tribal, and federal governments. For example, you can create an app that gives consumers and small businesses valuable information about their communities in an easy to understand, mostly graphic way on their cell phones; an app that delivers contract and seasonal job post alerts in English and Spanish via text message; an app that connects people to health care in their communities via public transportation; or an app that makes it easy for people with limited digital or English proficiency to go through intro screens without extensive instructions or pressing many tiny keys. The FCC seeks to promote broadband deployment and adoption for all Americans. New applications can pull new users online, as well as increase the value of a broadband connection for existing users. Consistent with the Knight Foundation’s mission to foster informed and engaged communities and FCC’s goal to encourage broadband adoption and deployment, the FCC and Knight Foundation are co-sponsoring this Challenge. With this contest, we want to reward experiments—good ideas—small ideas with big impact that can be replicated throughout the country. The Challenge Submission Period begins on April 14, 2011 and ends at 11:59 EDT October 3, 2011 (the "Challenge Submission Period"). The Challenge Administrator’s computer, set to Eastern Daylight Time (EDT), is the official time-keeping device for this Challenge. Entries may be submitted beginning at 12:00 AM on April 14, 2011 and must be received by October 3, 2011 11:59 PM EDT. Winners will be announced on a date and time to be determined. Participants shall apply via the Challenge.gov portal and add a link to the fully functioning app or demonstration and your source code. To qualify, you need to build an application -- web, mobile, or text/SMS based -- that uses one of the OSI Approved open source licenses. Any data source used must be publically available. You will need to host your own application during the judging process and ensure that our panel of judges has easy access to your application (or, in the case of a mobile platform that the judges may not have access to, a demonstration of the working product). Refer to the rules for important information regarding eligibility, prizes, and other requirements. Please follow @communityapps on Twitter, or the Apps for Communities Facebook page for updates and news. Does the app provide easy access to relevant content with an emphasis on hyper-local data from cities, counties, townships, Tribes, and states? Does the app enable better links between Americans and services provided by government? Is the app simple, well-designed, and easy to use for the intended audience, e.g., low-income, rural, seniors, people with disabilities, the low digital/English literacy communities? Is the app usable by and useful to people with disabilities? How likely is this app to survive post contest? Is this a viable app? Is the idea promising enough to warrant sustained development and attention? Is the app likely to promote broadband communications adoption, particularly among Americans who may not be regular Internet users (including low-income, rural, seniors, people with disabilities and the low digital/English literacy communities)?